Congratulations to everyone who took part, and congratulations to our winners! Another great day of competition at The Oxford Gun Company for The Schools Challenge Oxford. Congratulations to all our winners and competitors! Here are the rules for the TSC Competitions in 2019. Don`t forget to read these before submitting your Entry Forms! 14 Feb 19 - London Shooting Fair - visit us! We`re going to be at the London Shooting Fair, on 22nd to 23rd March 2019, at The Business Design Centre, 52 Upper Street, Islington, N1 0QH. Why not come and see us, have a chat with David Florent and James Marchington - we`d love to see you, and to hear any ideas you`ve got for TSC TV channel too! Whilst we`re there, we can also help with gun fit, gun mount, and any advice you need on buying a new gun - we`ll also give you a FREE LESSON VOUCHER with any gun purchase! Running from Friday 1st February to Saturday 2nd March, The February Challenge comprises 125 targets (100 sporting + 25 DTL), with prizes in Open, Junior and Members/Ladies categories, and prizes down to 4th place in each category! Entry fee is £47 for non-members, and just £40 for members. Come and join us for this great competition! Get the dates in your diary NOW - and don`t forget to book early to avoid missing out.....! Here are the results from Saturday`s TSC Grand Final - a HUGE congratulations to the overall winners, Chloe Applin & Charlie Madden. We`d like to sincerely thank all the brands & companies that have supported and sponsored us for 2018, making this another fantastic year, and enabling us to give away such amazing prizes! The competition is made possible through their continued generous support. 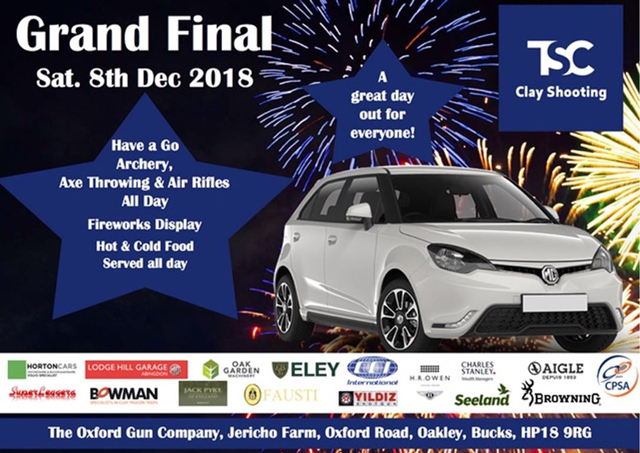 The GRAND FINAL of this year`s TSC will be held on Saturday 8th December 2018. We`ll have 50 & 100 sporting multi-activites from 1pm, with a fireworks display at the end of the competition, after we`ve announced the winners! Hot and cold food & drinks will be available all day in The Old Barn Cafe - so why not come and join us to watch the final, and celebrate with our finalists and winners? Our very own David Florent has a full page feature in Sporting Gun magazine this month, talking about The Oxford Gun Company, The Schools Challenge and what the shooting industry should be doing - an interesting read! Why not join us for late night shopping until 7pm on selected Fridays in November and December 2018? Get your early (or last-minute!) gifts, and get kitted-out for the shooting season! On Saturday 13th October, we`re hosting the Finders Keepers Charity Shoot 2018, in aid of Cancer Research UK! All ability levels welcome, with Have-A-Go entry at £30, and competition entry shoots at £20. Prizes for both categories, including trophy, cash and chapagne! Once again we`re running our TSC Winter Series throughout September, October and November! 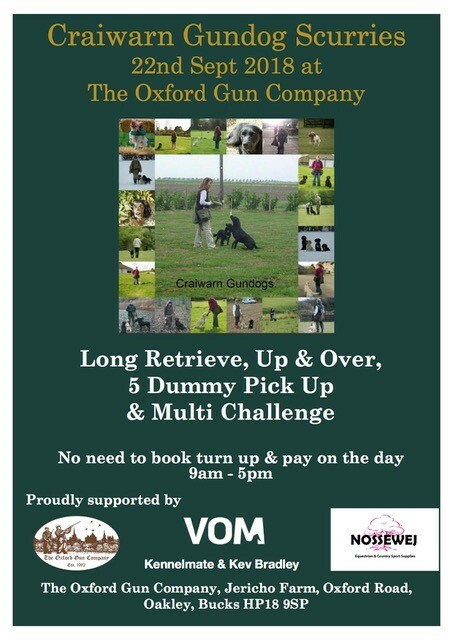 Bring your dogs along to the Festival on 22nd September - we`ve got a Long Retrieve, Up & Over, 5 dummy pick up & multi-challenge. No need to book - just turn up and pay on the day! 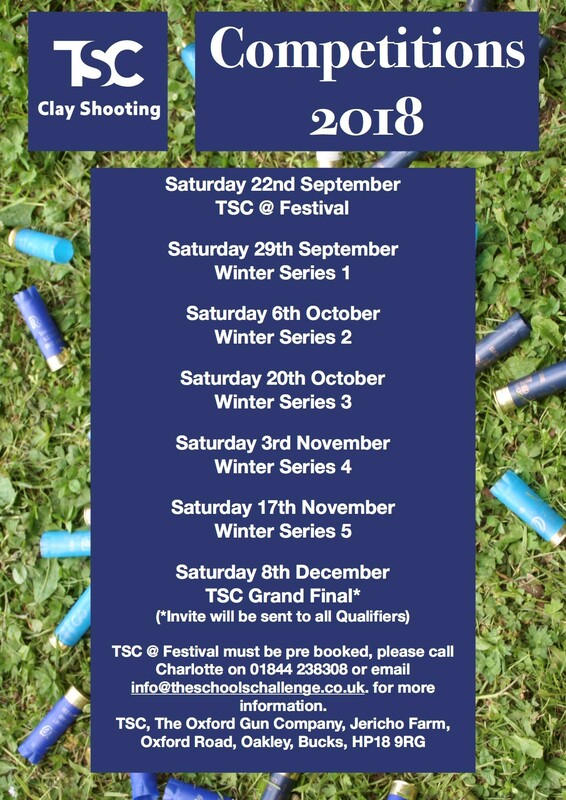 Don`t forget the TSC kicks-off on Saturday 22nd September, with the first qualifier at The Oxford Gun Company Festival of Shooting! We`re giving away TWO cars to our winners - so don`t miss out on your chance to WIN! Come and see the surprising new MG3 at the Festival of Shooting and Countryside on 22nd September! We`ll also have a selection of other new MGs, and quality used cars on display - so why not come down and take a look? If you`re a car fanatic, you`re in for a treat on Saturday September 22nd at the Festival of Shooting and Countryside! We`ve teamed-up with "PADDOCK PARADISO" to bring you a selection of stunning display cars, motorcycles and art, with "PADDOCK LIFE"!